Making the switch from eyeglasses to contact lenses isn’t easy for some patients. While eyeglasses are a quick and easy solution to supplement their eyesight, contact lenses are something of a lifestyle overhaul. Adding extra steps to your morning and evening routines may sound like a pain, but contact lenses can significantly improve your eyesight without the awkward hassle of eyeglasses. If you’re making the change yourself, be sure to read up on the must-haves and need-to-knows of contact lenses! Contacts are never one-size-fits-all. Because everyone’s eyes and needs are different, so must be their lenses. Typically, contact lenses are divided into two categories: hard lenses or soft lenses. Soft lenses are the most comfortable variety, but may not provide the improvement needed for individuals with eye conditions such as astigmatism. Hard lenses are more rigid while offering plenty of airflow. Often, patients with itchy, watery or deposit-ridden eyes prefer hard lenses for better vision. Consult with your ophthalmologist to determine the best contact lenses for your needs. Enjoying the benefits of contact lenses for years to come often means paying close attention to and adjusting your hygiene routine. 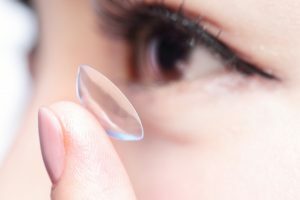 When you begin using contact lenses, you’ll need to practice and develop good habits to avoid damaging your lenses or eyes. When putting in and removing your lenses, always be sure to start with the same eye every time. This helps ensure you never forget to put in or remove one lens and that you never mix them up. If you ever need help applying or removing contact lenses, consult your eye care professional. Before touching a contact lens, wash and dry your hands thoroughly. If you forget to do so, dirt and oil from your hands can contaminate the lenses or your eye, potentially leading to damage. This also applies to eye-rubbing throughout the day. Although it can be easy to rub your eyes absentmindedly, making an effort to avoid it will help maintain your eye health. Visually check your eye’s health regularly to ensure your contact lenses aren’t hurting or irritating your eye. Though many don’t realize it, your eyes, and subsequently your contact lenses, can collect a lot of dirt and grime throughout the day. To keep your lenses from being damaged or potentially damaging your eye, clean and disinfect them every time you put them in or remove them from their storage container. All contact lenses will eventually wear out and will need replacing. Establish and stick to an ordering schedule to ensure you always have fresh lenses when you need them. As always, consult your eye care professional for help in establishing a cleaning and ordering routine for yourself. For many patients who struggle with their eyesight, contact lenses provide a significant improvement to their quality of life. Improve your eyesight, even with astigmatism, without the irritation of maintaining eyeglasses. 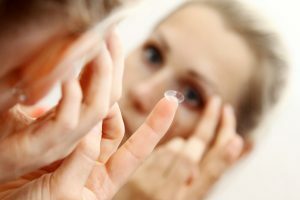 The friendly eye care professionals at Edina Eye Physicians will help you determine the best contact lenses for your unique needs and help you transition into a new eyeglass-free lifestyle. Contact us online or call 952-832-8100 to schedule your appointment today!